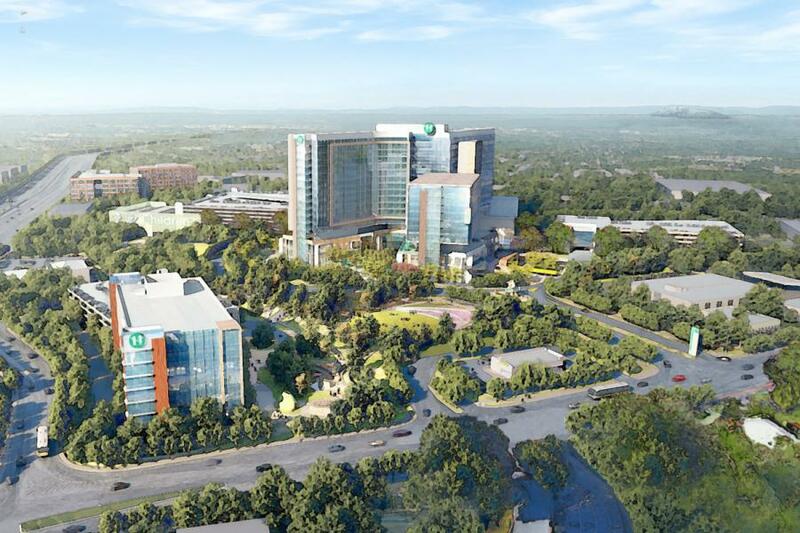 Construction of Children’s Healthcare of Atlanta’s $1.58 billion North Druid Hills Campus is expected to begin in 2020. Children's Healthcare of Atlanta on Nov. 17 unveiled the master plan for its new North Druid Hills Campus in Atlanta, which will include a 446-bed replacement hospital, the Center for Advanced Pediatrics, support buildings and more than 20 acres of greenspace and miles of walking trails and paths. Georgia approved Children's Healthcare of Atlanta's certificate-of-need (CON) application for the replacement hospital a week earlier. The $1.58 billion project is the largest in the history of the state's CON program. Construction will likely begin in 2020, with completion expected in 2026. The plans — informed by months of meetings with community members, patient families, physicians, nurses, employees and local officials — will transform an existing landscape of asphalt and one-story, 50-year old office buildings at the intersection of I-85 and North Druid Hills into a pediatric healthcare destination set in a healing, natural landscape. "Our goal is simple: to help more children get better faster," said Donna Hyland, CEO of Children's Healthcare of Atlanta. "Georgia's pediatric population is growing, and our new campus will allow us to meet our state's need while improving health outcomes for our patients in a transformative environment for our patient families, physicians, staff and our neighbors." Architecture and landscape design firms HKS and HGOR Inc. worked with Children's to take advantage of the acreage and views afforded by the campus's location. "This new campus is designed to serve our community's needs now and for generations to come," said Jonathan Goldman, chairman of the Board of Children's Healthcare of Atlanta. "The master plan creates a unique environment of healing while providing access to the highest-quality care, facilities and outcomes." Many patients will enjoy views of the Buckhead, Midtown and downtown Atlanta skylines. Others will enjoy views of Stone Mountain and distant outlines of the Appalachian foothills. All patients will be able to enjoy tremendous amounts of natural light and views of more than 20 acres of planned gardens and greenspace on the campus. "These views — while exceptional — are what we call ‘healing views'," said Bob Farrow, principal at HKS. "Research indicates that patients who enjoy natural light and outdoor views heal faster, require less pain medication and have shorter stays. A green campus designed with efficient clinical spaces is vital to achieving these outcomes." The new acres of greenspace on campus will do more than serve patients, employees and families — they also will help cleanse stormwater runoff, contributing to improved health for Peachtree Creek. Four times the number of trees currently on the site will be planted, bringing new hardwood trees and helping to restore the tree cover and canopy that earned Atlanta its nickname of "the city in a forest." Anchored by the replacement hospital in the middle of the site, the campus also will feature the Center for Advanced Pediatrics, more than 20 acres of greenspace and miles of trails and paths, and support buildings along the I-85 frontage road. Plans call for 446 beds in two patient towers, with an attached medical office building and a consolidated AFLAC Cancer and Blood Disorders Center. Additional structures planned for completion by 2026 include a central energy plant that will allow for efficient and sustainable energy on site and ancillary parking decks. As part of its campus plan, Children's anticipates investing more than $40 million to help improve public health and safety. Planned investments include funding for significant road improvements nearby, including kicking off the process for redesigning the I-85/North Druid Hills intersection, an improved access point from North Druid Hills Road and improvements on several nearby arterial roads. Additional plans call for a new connection underneath I-85 that will allow direct vehicular access to the campus. This connection also will enable surrounding neighborhoods, Executive Park and Cliff Valley Way to have eventual access to the planned Peachtree Creek Greenway. New sidewalks also will be built on the edge of the new campus. All transportation and infrastructure investments will be carefully coordinated with local governments and relevant organizations. "We intend to be a catalyst for long-awaited transportation and infrastructure improvements along this corridor," said Hyland. "Our investments will make it easier for our patient families to reach us and improve some existing traffic and pedestrian challenges for our neighbors." The Brookhaven Planning Commission previously requested that Children's provide additional details on its master plan prior to considering the annexation and rezoning of adjacent land for Children's proposed support building. Children's will present the updated master plan at the planning commission's Dec. 6 meeting. Children's will follow a zoning process chosen by Brookhaven for its new campus, which will involve adjustments to the language of the city's industrial zoning district to accommodate the new campus. Public hearings on the proposed zoning amendments will be held at the Brookhaven Planning Commission meeting on Dec. 6 and at the Brookhaven City Council meeting on Dec. 12. "Children's North Druid Hills Campus is going to create a new front door for Brookhaven while providing a healing natural environment for children from Brookhaven and across the state," said Brookhaven Mayor John Ernst. "We look forward to learning more about their plans in the next few months." Once finalized, campus plans will be submitted to the Atlanta Regional Commission as a Development of Regional Impact (DRI). Children's expects that process to take four to six months. The project features additional beds and expanded services that allows Children's to relocate from Egleston Children's Hospital, on Clifton Road in Atlanta, to the North Druid Hills property in Brookhaven. "We are pleased that the Department [of Community Health] recognized the long-term value of this new hospital for Georgia's current and future generations of children," Children's Healthcare of Atlanta CEO Donna Hyland said in a statement Friday. "We remain laser-focused on top-quality patient care and operational excellence at all of our facilities as we plan to start construction on the new hospital in early 2020." Health system officials said that visits to Children's, including Egleston, are increasing faster than overall population growth, causing the need for additional beds.